I’ve been looking at many maps these last few weeks, but sadly not maps of hiking trails. Instead, I’ve been scouring air pollution and forest fire tracking maps trying to discern how bad the air quality is each day, how long it will last -- quite a shift this summer. So what about this map below? Is it showing lower temperatures and less pollution as the wind (hopefully) shifts and blows the forest fire smoke away? 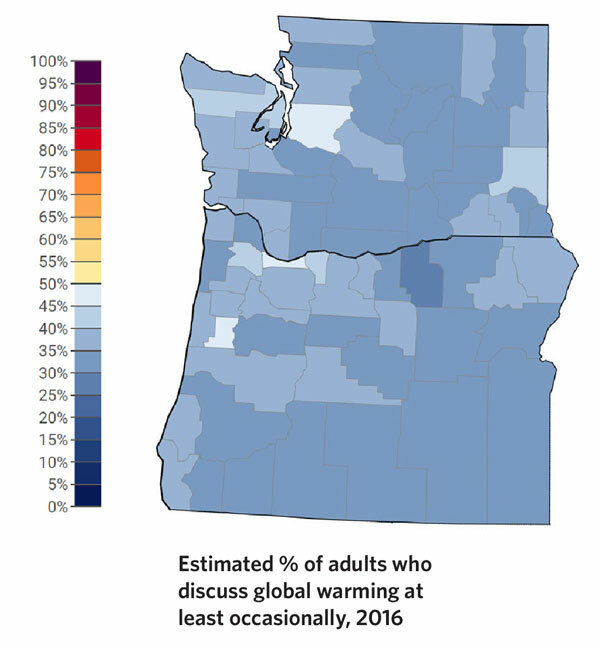 It is the estimated percentage of adults who discuss global warming at least occasionally in the Pacific Northwest (Yale, 2016). 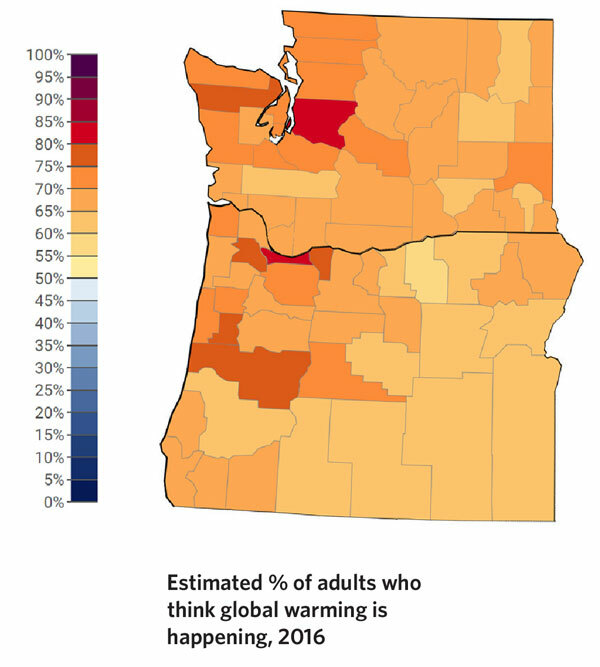 This map shows that most people do understand that that global warming is happening. Together these images confirm that we know we have a problem, but most of us are not talking about it. Why does talking about global warming, especially related to our recent shared smoky experience, matter? For starters, the Yale Center for Climate Communications found through its research that if people draw a personal connection to being impacted by global warming, they’re far more likely to take action to solve it — double digits more likely. If we talk about how climate change affects our lives, it becomes a close-to-home problem rather one happening farther away or in the future. This weekend is bringing a needed reprieve from the smoke for many - though certainly not all - Northwest communities. As the skies get clearer, we should keep talking about global warming -- how it’s one of the reasons the smoke has been so bad, and what we can do about it. Everyone experiences the weather and we often talk about the weather to make small talk. It’s true that short-term weather is not the same as longer term climate change, but talking about strange or severe weather -- like these unusual smoky skies -- can be a way to bond over whatever is happening right now to start the conversation. The forest fire season is longer, with fiercer and more frequent fires, because of a changing climate. Drier forests, hotter temperatures, and drought-like conditions create a much bigger tinder box far more likely to catch fire — whether it's then human or natural causes that lights the match. Bringing up the recent smoky, dry weather can also help you take the temperature for trying out a broader climate conversation. The recent forest fire smoke was kitchen table conversation almost everywhere in the region. One way to draw that personal connection is to listen to how these climate impacts are showing up in people's lives, here and now, right outside our windows. What is different? How has it been these past few weeks for the other person? This can bring up deeper feelings, as folks can get anxious about the increasing climate disruption (see tip #3!). I know I have felt down with the smoke around and friends have shared feeling the same. So a personal connection could also be about sharing why you care, your values, love of place, and inquiring about why they care and are feeling concerned too. Very few people are talking about global warming in large part because we are anxious about it. You could try offering something like, “I get that global warming makes you feel anxious. Me too sometimes.” I’ve been trying that out, most recently with my kids as we talked about the smoke and fires. Instead of being paralyzed or suppressing that anxiety, we can channel those strong emotions toward connection and engagement. While poll after poll shows that American voters overwhelmingly support clean energy solutions like wind and solar power, the confidence gap is still real. We don’t necessarily see solutions every day or happening at the scale needed. Nor does it help that the fossil fuel industry and their allies spends lots of time and resources to spread disinformation about the science and seed political doubt that the clean energy revolution already happening. People likely need a double helping of solutions and stories of success. Does it feel daunting? You bet. But we have the knowledge to fix this mess. A bright spot in the news coverage about the smoke pollution? Scientists are confirming we can still do this. One idea is to share a story of clean energy ingenuity success that you’ve recently heard or seen (see below for resources). Here’s an example: On the same day the air quality index was hazardous and President Trump announced his proposal to rollback the Clean Power Plan, the City of Spokane passed a law to have 100% of their electricity come from renewable energy by 2030. There are lots of inspiring people and projects all around us happening now. If we can scale them up fast enough and accelerate this transition to clean energy, we can still have thriving communities and a safe planet. My dad loved the adage from pitcher Lefty Gomez: "If you don't throw it, they can't hit it." Take a risk and start a conversation. Will we solve a global problem one conversation at a time? Not by itself. We have lots of work to do to head off the worst of climate change damage, galvanize public pressure to create more political will, and accelerate solutions faster. You are needed. We all are. Yet the maps help us see the majority of people around us know global warming is happening and think it’s a big problem. They care. But they are likely unsure or afraid to speak up. When we share our strong feelings about urgency and hope -- speaking from the heart -- we will at least open the space up to invite more people into the conversation and gain support for solutions. We can move beyond this meta-silence and fear to a place of more action for positive change. 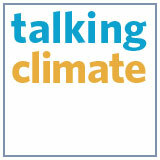 Let us know how it goes as we all work to foster meaningful climate conversations and engagement.